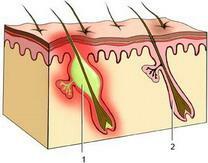 Folliculitis is inflammation of the hair follicle (follicle) is a widespread disease caused by Staphylococcus. Often folliculitis develops on the background of strong sweating, contamination and scratching of the skin, irritation particles of coal, cement, etc., Folliculitis can develop as a complication of scabies, eczema. There are superficial and deep folliculitis. Superficial folliculitis (ostiofollikulit) is characterized by the development of small pustules (abscess) value from a pinhead to small pea, surrounded by a ring of hyperemia and penetrated in the centre of hair. On the 2nd or 3rd day of the contents of pustules dries up in the crust, which quickly disappears, leaving no trace. Perhaps a sense of itching, burning. The number of pustules may be different, sometimes up to many tens. Deep folliculitis is a knot the size of a pea, bright red, on top of which often develops pustule. After a few days nodule or slowly absorbed, or subjected purulent melt with formation of small funnel ulcers heal the scar where the hair in the future do not grow. Folliculitis often localized on the face (see Sycosis), on the scalp, the limbs. Produce professional, or oil, folliculitis, caused at the rear of brushes, extensor surfaces of the forearms in contact with fuels and lubricants (kerosene, black oil and others), as well as medical tinea developing rubbing mercury, tar and other ointments (see Dermatitis). Treatment: addressing the causes skin irritation. Pustules open and lubricated 1-2% alcohol solution of aniline dyes (brilliant green and others), to put a knot net Ichthyol. The affected skin wipe or salicylic with camphor spirit. When a large number of deep tinea shown, antibiotics (penicillin and other), chronic recurrent folliculitis - autohemotherapy, staphylococcia, toxoid, vitamin (a, C). Prevention: the hygiene of the skin, timely treatment of diseases, against which may develop folliculitis; in the conditions of production - limiting contact with grease, oils, use of protective clothing, regular baths, soap washing. Caution use of mercury, tar ointment, especially for people with severe owolosenie skin, immediately canceling them at the first sign of folliculitis.